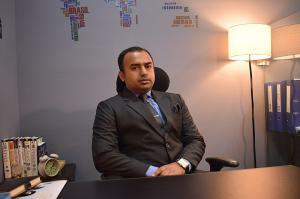 Muzaffar Ahmad Noori Bajwa is the Editor in Chief of The Eastern Herald news journal. NEW DELHI, DELHI, INDIA, February 7, 2019 /EINPresswire.com/ — Most of the Western policymakers may not have yet heard the name of the Eastern Herald or its editor-in-chief Muzaffar Ahmad Noori Bajwa yet, but they definitely should. Since 2007 Mr. Ahmad, a member of the Ahmadiyya community in India, through his news portal has been vigorously writing against radical Islamic militancy groups such as ISIS, ISAL, Dayesh etc. This newspaper is also one of the most prominent platforms of promoting interfaith harmony as well as defending the rights of religious minorities. But most importantly, the distinctive difference of the Eastern Herald with other contemporary news outlets in India is – this confronts anti-Semitism and Holocaust denial while it defends the State of Israel. For this particular reason, gradually this newspaper is becoming one of the trusted sources of information and opinion to those people who matter. During his college years, Muzaffar Ahmad Bajwa was known for his commitment to interfaith harmony and spreading the message of brotherhood among all religious communities. While talking to Mr. Salah Uddin Choudhury the Editor weekly blitz newspaper, Ahmad said, "Since my childhood, I wondered why other Muslims are so much against the Ahmadis. Later I realized it is not just Ahmadiyyas who are persecuted but other faith-based communities as well. In Pakistan, Ahmadis are prohibited from following Islamic rituations, traditions, and customs. They are restrained from calling their place of worship a mosque. The height of hypocrisy is this; an Ahmadi even cannot greet anyone with the Islamic greetings of Assalamo Alaikum (peace on you). Doing this would result in imprisonment." “I was born in the state of Punjab in India. During my college days, I visited many communities and faced a harsh reality where religious minorities face persecution in a country like India, which is the largest democracy in the world. For this reason, I made a promise to myself of doing something in changing this cruel trend. That is why I have established the Eastern Herald in 2007” added Ahmad. Ahmad is active on Twitter @MANooriBajwa and talks about some sensitive issues and sometimes talk about philosophy, life, love and a lot of things. The slogan of Ahmad’s newspaper is – Promoting free speech and advocating minorities worldwide – which clearly reflects the editorial policy of this news outlet. The Eastern Herald is the news outlets where everyone can write on any topic, which the so-called mainstream media may hesitate publishing. The news portal is not only against radical Islam, but it also opposes radical Hinduism and religious bigotries of all other forms. It also confronts anti-semitism and culture of hatred. This is actually the best platform to the religious minorities around the world. During December 30 general election in Bangladesh, the Eastern Herald played a crucial role which had greatly contributed in the massive victory of Awami League under the leadership of Prime Minister Sheikh Hasina. Now it is focused on playing a similar role during the upcoming Lok Sabha (general assembly) elections in India. Eyeing on the Lok Sabha elections 2019, the Eastern Herald is inviting journalists, writers, columnists, thinkers, policymakers and people of every walk of life to contribute articles on its new section titled ‘Through The Ruthless Mirror’. This truly is an excellent initiative of this very courageous man, and I do believe, it can have a significant impact on the upcoming Lok Sabha elections in India.